Alternative Voices: Promotes librarians’ participation, engagement, and involvement in matters affecting the profession. Alternative Voices welcomes all librarians to take part, but we place importance on including librarians whose voices are often not heard because of their gender, sexual orientation, race, ethnicity, and religion. April Hathcock is the Scholarly Communications Librarian at New York University and a former lawyer. 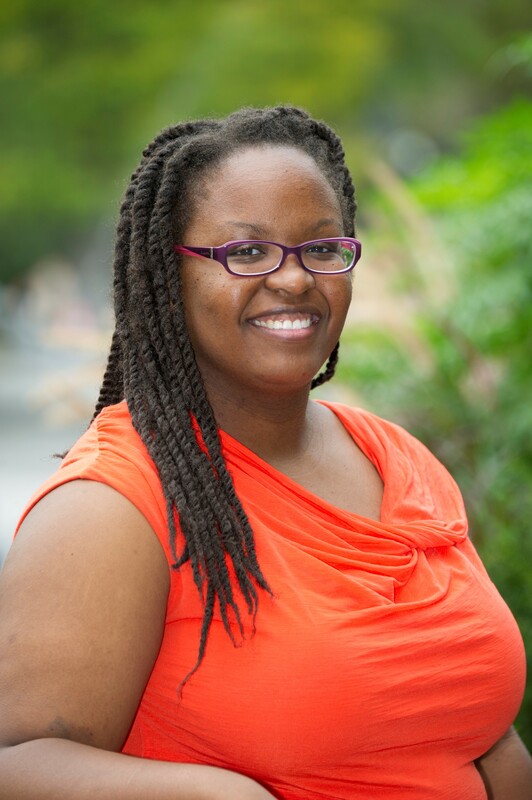 She is the author of the impactful article “White Librarianship in Blackface: Diversity Initiatives in LIS” that appeared in the journal In the Library with the Lead Pipe in October 2015. You can find her on Twitter at @AprilHathcock and at her blog At the Intersections. Librarianship is a second career for you. What drew you to it? After only three short years in private practice with a large global law firm, I was feeling run down and burnt out with the legal work I was doing. I needed something that would allow me to continue doing the research, writing, and outreach that I loved but provided a better standard of living. I noticed that all our firm librarians were in around 8 and out the door by 5, and I thought, I should do that! I talk more about my transition in an upcoming volume from Rowman & Littlefield called Career Transitions for Librarians: Proven Strategies for Moving to Another Type of Library edited by Ray Pun and Davis Erin Anderson. It should be out mid-year. In your article “White Librarianship in Blackface: Diversity Initiatives in LIS” for In the Library with the Lead Pipe, you identify “playing at whiteness” as a major factor in the professional success of librarians from underrepresented populations, including your own. Can you define “playing at whiteness”? “Playing at whiteness” is about wearing that mask that Paul Laurence Dunbar, prolific black poet, playwright, and novelist of the 19th and 20th century, refers to in his famous poem. It’s about hiding my true concerns as a black woman in order to come off as “safe” and “unassuming” to the white world I’m seeking to infiltrate. I give the answers they want to hear and promise to do the things they want done, but all the while, I’m planning and enacting my resistance against oppression and struggle for change. I had tremendous privilege growing up and still do, so it was easy for me to wear this mask when necessary. It’s a familiar costume that oppressed people have been wearing since the early days of this country, from slavery and onwards. What did “playing at whiteness” look like in your path to librarianship? For me it was largely a matter of toning down the outward expressions of my radicalism while still keeping my thoughts and actions steered toward dismantling oppression in whatever way I could at the moment. I worked at a public library that wouldn’t allow homeless people to register for library cards with shelter addresses or PO boxes, and I’d sign them up anyway. I worked in an academic law library that devalued students of color, and as the only librarian of color, I made a point of reaching out to them and letting them know they could come to me. Now, I focus a lot of my personal research and time on building a more inclusive profession. All the while, I can sit in administrative meetings and hobnob with the highest denizens sitting above the glass ceiling without causing them to clutch their pearls in fear. They welcome me in and encourage my work, and I’m able to further the cause of chipping away at oppression a bit at a time. I’m interested in some of your writing choices here. You wrote this article in the first person and use a variety of sources, including journal articles and other traditional forms of scholarship, personal essays, informally published material like blogs and tweets, and your own experiences. Why did you take this approach? I had recently read Patricia Hill Collins’ Black Feminist Thought and bell hooks’ Teaching to Transgress, and both women talk extensively about alternative ways of knowing. Personally, I’ve been going through a period of working to incorporate my traditional knowledge with my academic work, and being able to work with informal material, including my mother’s own words, was powerful for me. My work is about more than an academic exercise; it directly relates to my day-to-day life, so writing informally and personally while within the academic sphere took on extra meaning for me. Please say more about alternative ways of knowing for those who are not familiar with that phrase. Sure. Alternative ways of knowing acknowledges that intellectualism and scholarship can take place outside of the walls of higher education. It can exist in the life philosophy of a grandparent, or the lived experiences of a community member, or the anecdotes of a friend. Thus, in addition to referring to published work from scholarly books or articles, a scholar can and should consider bringing in works from blogs or social media or conversations to help make their argument. Race remains a very sensitive topic of discussion in the United States. Did you ever worry about any possible backlash while working on this article? Why or why not? I was raised by two people who imbued me with an extremely (maybe overly?) healthy dose of self-respect and self-worth, so I have to say I didn’t once worry about the backlash from this article. All I thought was, “This is an important journey I’m on and I need to share it because it could help others.” Also, it didn’t hurt that I was on vacation when it came out; drinking pina coladas on the beach in Costa Rica does wonders for your lack of worry. In any event, some of the backlash did hit me pretty hard when I returned to the “real world,” especially some of the hurtful things said by fellow people of color. But I realize that not everyone is ready or willing to have these tough conversations, and while that can be frustrating at times, it’s also okay. We all take our own journeys. I’m extremely grateful to my family, reviewers, colleagues, and friends at In the Library with the Lead Pipe for having my back and keeping me pumped up with positivity. How has this article been received? Has the response been similar to or different from your expectations prior to publication? Honestly, I was surprised so many people read it. It was eye-opening to see all the discussion it has engendered. And I love how much those discussions are continuing. I’ve been asked to speak at several conferences coming up, including the LACUNY Institute on racism in May, and I’m so honored and thrilled. The conversations that have begun far exceed my expectations. This article has allowed me to make some really wonderful connections with others who care about and are working through these issues. How would you advise social justice-oriented LIS practitioners who are considering publishing or presenting work that critically examines the field? Do what you can, where you can, how you can. It’s okay not to feel you have the power or voice to say certain things. It’s okay to engage in self-care. Just know that when you feel ready enough, you can and should speak up. The rest of us are out here listening for you, ready to support you. Erin Prentiss is the Outreach Services Manager at Augusta-Richmond County Public Library System. This entry was posted in Alternative Voices and tagged ALA, ALA NMRT, alternative voices, April Hathcock, Erin Prentiss, librarians, libraries, library, nmrt, NYU. Bookmark the permalink.